Between approximately 20,000 and 5,000 years ago, water previously locked in glacial ice returned to the world’s oceans, and the sea-level rose over 300-feet to approximately its current level. Rising sea levels flooded the previously dry, earlier reef deposits, which had formed hundreds of thousands of years previously when sea level was comparable to modern levels. The undeveloped natural condition of the area consisted of low-lying marshes, tidal flats, fishponds and reef areas. Beginning in the late-nineteenth century, these low-lying areas were filled in and then developed, which permanently changed the area into its present fully-urbanized character. Leaving his birthplace in Maui, ʻAiʻai traveled around the islands, establishing koʻa kūʻula and ko‘a ia; on O‘ahu, he landed first at Keana Point, and then traveled around the island. In addition to Kakaʻako, the modern reference to the area also includes lands once known as Ka‘ākaukukui, Kukuluāe‘o and Kewalo, and possibly smaller portions of other ‘ili. Kukuluāe‘o, translates literally as the “Hawaiian stilt (bird)”, “to walk on stilts.” Pukui describes the area as “formerly fronting Ke-walo Basin” and “containing marshes, salt ponds, and small fishponds,” an environment well suited for this type of bird. Henry Kekahuna described it as an area where salt was formerly made. Kewalo literally means “the calling (as an echo)” – it is the area between Cooke and Sheridan Streets. According to Pukui, “outcasts (kauwā) intended for sacrifice were drowned here”. Kekahuna said that at one time, it also had a sand beach as a part of the area, where various sports, such as surfing, were held. In traditional times, the area was characterized by fishponds, salt ponds, trails connecting Honolulu (Kou) and Waikīkī, and occasional taro lo‘i. The area was traditionally noted for their fishponds and salt pans, for the marsh lands where pili grass and other plants could be collected, for ceremonial sites such as Puʻukea Heiau, Kewalo Spring and Kawailumalumai Pond at which sacrifices were made, and for their trails that allowed transport between the more populated areas of Waikīkī and Honolulu. Important chiefs such as Huanui-ka-la-la‘ila‘i were born in the area and conducted religious rites, and commoners traveled to the area to procure food and other resources; some commoners probably also lived in the area, possibly adjacent to the ponds and the trails. Kakaʻako is also associated with legendary accounts of the Waters of Haʻo, Kapoi and the heiau, and the legend of Hiʻiaka and more. In 1911, it was estimated that about one-third of the coastal plain at Kakaʻako was a wetland. Hawaiians used the lagoonal/estuary environment of the Honolulu plain to construct fishponds. In the post-Western Contact period, when the fishponds were no longer used, they were more often than not filled with material dredged from the ocean or hauled from nearby areas, garbage and general material from other sources. These reclaimed areas provided valuable new land near the heart of growing urban Honolulu. 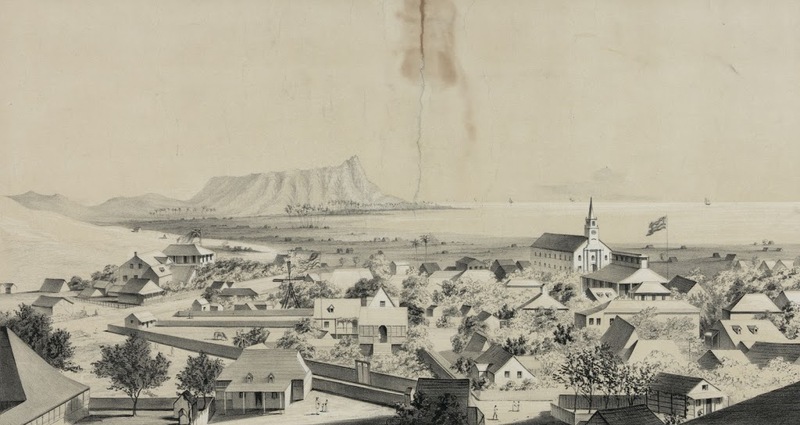 Shortly after the turn of the century, Kakaʻako was a community of small stores, churches, schools, parks and clusters of residences in ethnic “camps” or neighborhoods. It has undergone lots of changes over the past century. As late as 1940, Kaka‘ako’s population numbered more than 5,000 residents. But after World War II, community buildings, wood-frame camp houses, language schools, temples and churches were removed to make way for auto-body repair shops, warehouses and other small industrial businesses. Few traces of its former residential existence remain. In the early 1950s, rezoning led to the conversion of the primarily residential and small business district into an urban industrial area. Decades after the transition from residential to industrial, Kaka‘ako is now slated for redevelopment. Plans call for the re-establishment of a mixed residential and business community – although recent development and present plans include several high-rise developments. Lots of information here is from reports from Cultural Surveys. The image shows an illustration of the region in 1854.